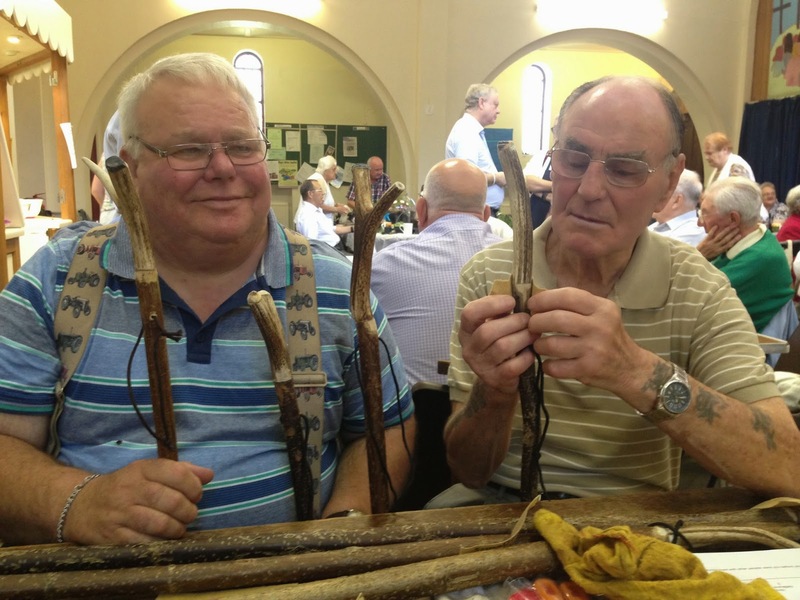 Caption: L-R Robin Silverwood, 66, and Eric Dalton, 85, working on one of their walking sticks. Older people in Leeds are sticking with some exciting new hobbies after getting connected with their local community. A number of the city’s Neighbourhood Networks, funded by Leeds City Council, have engaged community connectors from their local areas, who are helping people to pass on their skills and knowledge to older residents through a new pilot project. Among those who have got involved through the scheme is 66-year-old Robin Silverwood, who is teaching members of Middleton Elderly Aid, along with other people from the area, how to carve their own walking sticks from pieces of wood found in their local park. Robin began carving walking sticks around 30 years ago from wood he found while he worked in Middleton Park for Leeds City Council’s Parks and Countryside Service. He has since taught a number of other local men how to craft their own sticks and even sources pieces of antler, shed by deer in Scotland, to carefully fashion the handles. He said: “I used to find all these bits of wood in the park and I started carving them just as a hobby. I was asked if I’d come along and show other people how to do it and now there’s quite a few of us who work on walking sticks every week. “Sometimes people come in and want to buy one too, which helps us to get more materials to keep the project going. “People have been carving their own walking sticks for hundreds of years but a lot of people living in a city would never get the chance to do something rural like this. Former motor mechanic Eric Dalton, 85, is one of those who has been taught how to carve his own walking sticks. Other activities set up through the community connectors include a group making their own terrariums (small scale ecosystems grown in glass containers) a baking group and a knitting group. The knitting group is currently working to create dozens of tiny blankets which they will then donate to the premature baby unit at Leeds General Infirmary. The community connectors pilot is being delivered by three of the city’s Neighbourhood Networks- Middleton Elderly Aid, Action for Gipton Elderly and Farsley Live at Home. The initiative is part of the Seniors Network Support (SeNS) project, which Leeds City Council is participating in, and which is part funded by European Regional Development funding through INTERREG IVB. “The community connectors project is an amazing chance for us find local people who are passionate about their area and give them the chance to pass on their years of knowledge and experience to other people in their community.